Select “Events” for the 2019 calendar of events! 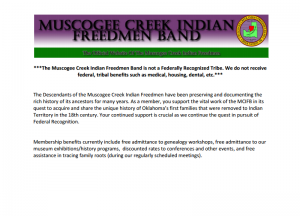 We are delighted that you are interested in learning more about the unparalleled cultural heritage and history of the Muscogee Creek Indian Freedmen! Our desire is that the untold history of the African Creek Indian is presented factually through historical documents, and preserved in the pages of history. Our website is designed to serve two purposes. First, it will serve as a resource, providing historical facts regarding the history and cultural heritage of the African Creek Indian Freedmen. Second, it will provide information regarding our plight as citizens of the Muscogee Creek Nation as it pertains to our political rights, defined by the Creek Treaty of 1866, Article 2. Freedmen. Check with us periodically for updates and calendar events that include conferences, genealogy workshops, museum exhibits, and other community projects. Don’t forget to view our Little Known History tab for information regarding the history of the Creek Indian Freedmen. The MCIFB is operated by the descendants of Creek Indian Freedmen; designated as Freedmen by the Dawes Commission in the late 1800’s. The Creeks hereby covenant and agree that henceforth neither slavery nor involuntary servitude, otherwise than in the punishment of crimes, whereof the parties shall have been duly convicted in accordance with laws applicable to all members of said tribe, shall ever exist in said nation; and inasmuch as there are among the Creeks many persons of African descent, who have no interest in the soil, it is stipulated that hereafter these persons lawfully residing in said Creek country under their laws and usages, or who have been thus residing in said country, and may return within one year from the ratification of this treaty, and their descendants and such others of the same race as may be permitted by the laws of the said nation to settle within the limits of the jurisdiction of the Creek Nation as citizens [thereof,] shall have and enjoy all the rights and privileges of native citizens, including an equal interest in the soil and national funds, and the laws of the said nation shall be equally binding upon and give equal protection to all such persons. 27-1308724. Your gift is tax deductible to the full extent provided by law.